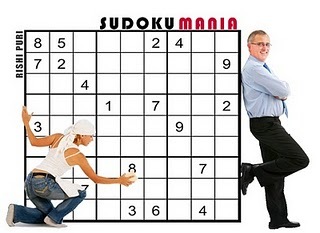 There will be a SudokuMania contest on the second weekend of March. The sudoku puzzles have been created by Rishi Puri for the UK Puzzle Association. The contest will be on the UKPA website. The contest will begin at 9:00 PM GMT on Friday, 11th March and end at 3:00 AM GMT on 14th March 2011. The test is of 2 hours duration. You can pick up the password anytime during the contest hours and you will have 2 hours post that to submit your solutions.